Without force. Without striving. Without straining. Without well meaning, but awkward, attempts to be what I’m not. Without well meaning, but awkward, attempts to do what I’m not called to do. That isn’t trying to happen. My expectations and attempts have been sincere. They have usually been the result of a well-meaning desire to heed the wise counsel and advice of those I love, respect, and trust. That’s a good thing. I believe in community and connection with all of my heart. None of us are meant to live in a bubble. We need each other. There are times we need others to see what we can’t see ourselves. I’ve had many of those times in my life. I’m so grateful for those God has used to speak into my life again and again. But, ultimately, my trust is in God–and God alone. Ultimately my allegiance is to God–and God alone. Because, ultimately, I will stand before God–and God alone. And there is always grace to follow Him. But there isn’t grace to follow even the wisest and most conventional of wisdom–from even the wisest and most loving of sources– when the request isn’t coming from heaven. His Kingdom is coming. His will is being done. All within the unforced rhythms of His grace. Just try to stop a river flowing at full capacity! It doesn’t have to “try” to keep moving–it just keeps going with the flow. I’m going to flow with the river. Because that’s what He’s asking me to do. I’ve stepped out of my comfort zone again and again (and again) at His invitation, and I will again (and again), when He calls. But I won’t force what isn’t happening. And I won’t keep trying to prove how willing I am to do “whatever” needs doing. He already knows I’m willing–even when I forget. The truth is, He never asked me to prove myself in the first place. He asked me to prove Him. As I do, I have a sneaking suspicion that out of my innermost being–and not my innermost “doing”–will flow rivers of living water. That passage from the MSG is the BEST! Loved it so much I blogged about it in March. Just now saw you wrote about it in 2012. LOL I’m understanding also that I don’t have to force His river. I’ve not always been here so it’s a good place to be. It IS the best! The Lord just keeps taking that message deeper and deeper. It us one we need! I suspect I may write about it yet again because I suspect that particular truth may need to go deeper still. I will have to pop over and read your take on it 😊 Blessings to you, Kate! “I believe in community and connection with all of my heart. None of us are meant to live in a bubble. We need each other. There are times we need others to see what we can’t see ourselves. I’ve had many of those times in my life. I’m so grateful for those God has used to speak into my life again and again. Amen. Ultimately, we are the ones who must confirm what God is doing in us. I was in a meeting with Dano McCollam recently and he talked about personal prophecy and why it’s not effective in people’s lives, why we actually hold it in contempt (because we aren’t doing anything with it.) The problem is, we’re not taught to judge the word, first to confirm whether it’s for us. Does it resonate within us (even if it’s something we’ve never pondered before)? Then, to find out how to activate it (identity, promises, conditions, times and seasons). Yes, that’s so good Mel. I think we are just now beginning to properly teach on how to judge and steward personal prophetic words. My “issue” has always been more along the lines of my responsibility in stewarding the words over my life. I’m pretty good at judging words and only taking on those that land, but I’ve had a much more difficult road in discerning what is and is not my responsibility in partnering with God in their fulfillment. As someone whose calling and relationship with the Lord has always been a bit out-of-the-box, somewhere along the line I managed to take on the label that I was “non-compliant” or even somewhat “rebellious” since I was never able to march in line very well. As a result, I’ve gone overboard trying to prove how “willing” I am to listen to others and do whatever I need to do to get where I need to be. But if I’m not feeling God on it, such attempts at proving myself rarely end well But He is always so gracious to pick me back up and set me back in the flow of His grace–and to remind me that HE never asked me to leave that place ❤ Not too long ago I heard Jake Hamilton say: "Reformers look just like rebels on the outside–the only difference is the attitude of the heart. And only God sees the heart." That really spoke to my heart. But…clearly I'm still a work in progress 🙂 Thanks for always adding such meaningful input and insight! 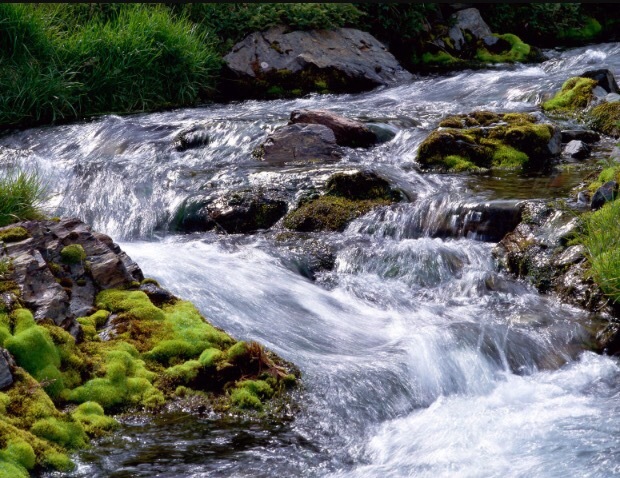 Unforced, unhindered, unrestrained…rivers of living water….gushing forth…flowing in and around those He loves. It speaks volumes to me. Thank you for sharing this beautiful message, Cindy! Amen, Glenda. It IS so beautifully simple and glorious. Now, to just stay there! 😉 Love and hugs to you!